One of the easiest ways to add impact to your images is to compose using what’s called the “Rule of Thirds” . Imagine your frame with a tic-tac-toe grid laid over it - where the lines meet is a visual strong point and is where the most important subject should be placed. When we first start taking photos, we have a tendency to put everything smack in the middle of the frame which can make for a very flat image lacking visual interest. 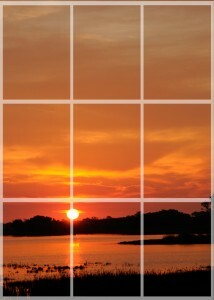 Some cameras (usually those with manual settings) offer the option for a grid to show in the viewfinder. You might find this setting in the custom settings or in the display options, your owner’s manual will help you locate it if it offers one. Using this grid can be helpful to remind you to compose differently and as a guide to where to line up your subject. Here are a few tips to help with the Rule of Thirds. In landscape images that show a horizon line like sunrise or sunset, avoid placing the horizon line going right across the middle of the image. Try instead to place the horizon in the lower third of the frame to accentuate the sky, or place it in the upper third to highlight that which is in the foreground. Position the sun off to the left or right, not dead center. When photographing a single person, position them off to the left or right of middle, then place their face in the upper third of the frame. 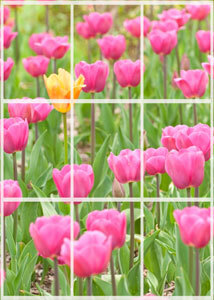 When you are framing a grouping, say of flowers, place the most important one (visually) at one of the bisecting points on the grid. Pay attention to what the subject is doing when deciding where to place it in the frame. Leave space for the subject to enter the frame instead of capturing it when it is leaving it. For example, capture a child throwing a ball into the frame, or a horse running into the scene, not galloping out of it. The default focus point on most cameras is set to the center of the viewfinder so look to your camera manual to see how to adjust this. Many offer selectable focus points which you can move throughout the frame and match up with the position of your subject. If your camera doesn’t offer this, try using focus lock. With focus lock, center your subject in the frame and lock the focus by pressing the shutter button down half way. Keeping the pressure on the shutter, recompose and position the subject off center, then depress the shutter fully to take the photo. For example, if photographing two people standing next to one another, the camera will focus between them because that is the center of the frame. The faces will be blurred and the point in between them sharp. Instead, focus on one of the faces, lock the focus by holding down the shutter button half way, then recompose and press the shutter fully. With existing photos, try using the crop tool in your editing program to apply the rule of thirds - see if it doesn’t make a more interesting photo. As the saying goes, rules are made to be broken and there will be times when a different type of composition is called for so don’t be afraid to try other things. But for a start, try using the “Rule of Thirds” and consciously position your subject accordingly. You’ll see the difference in your photos as well as the response from those viewing them.